For me, this time of year has always been the toughest time to mentally push through my runs. The summer heat is still hanging on and it feels like fall can’t get here fast enough. It doesn’t help that this is also the time of year when my mileage is often peaking for fall races. So, I’m sick of hot, humid, sticky weather, and I’m having to spend more time in it. When I’m struggling, I draw from the mental tricks I’ve learned in my yoga practice to help get me through. I wanted to share some of those tricks with you today just in case you’re struggling, too. I may hate running in hot, humid weather, but unfortunately I am unable to control the weather. (Although wouldn’t it be nice if I could?) I have to remind myself that ruminating on the conditions outside isn’t doing me any good. In fact, it can put me in a bad mood, which can throw off my entire run. I’ll start to worry about how the heat is affecting my run, and how hot it will be on race day, and what time will today’s pace translate to in colder weather? None of those thoughts really helps me be a better runner. I’ve had similar thoughts on my yoga mat. I’ve started wondering what the temperature is set to in a heated class. I’ve started to fixate on when my teacher will let us get out of an uncomfortable pose. I’ve started to compare my pose to what my neighbors are doing. These are all things that I can’t control. But, these are also all things that yoga has taught me to let go of. My yoga mat has given me the space I need to practice mindfulness and to practice letting go of the things I can’t control. It may not be easy at first, but it does get easier. So, if you struggle with worrying too much about the parts of your run you can’t control, first, practice noticing that you’re having those thoughts. Then, gently turn your attention to something more positive, something you can control (like your thoughts). Don’t get upset with yourself for feeling the way you did. Instead, just understand that you can turn those thoughts around and be more positive. Along with focusing on what you can control, it also helps to focus on the things you can do instead of thinking about what you can’t do. Again, thinking negatively about yourself or your circumstances doesn’t do any good. And, if you expect less than your best, or if you think you’re incapable of doing something, you won’t see the results you want. This used to happen to me all the time when I was doing speed work. I’d have a goal pace for my tempo or interval runs, but sometimes I wouldn’t hit that pace. Sometimes I’d be having a bad day; my legs didn’t get recover too well from my last run or I didn’t get the sleep I needed. Sometimes it would be really hot out, which slows me down more than many runners. So, I’d start to stress about my pace, which brought in a whole flood of negative thoughts and totally sabotaged my run. On my yoga mat, I’ve learned to practice letting go of those thoughts. I still have similar thoughts on my mat—”I can’t hold this pose any longer,” or “I’m not as flexible as I should be,” or, “I held this balancing pose better yesterday.” But, my yoga practice has also helped me learn to accept who I am in that moment. I’ve practiced letting go of those comparisons or those self-defeating thoughts. I’m not saying that they don’t still pop up in my head, but I’ve gotten much better at releasing them because I’ve practiced doing it. I naturally have a pretty analytical mind, so I also have a tendency to constantly compare myself to how I’ve performed in the past. That’s great when I’m seeing progress. “Wow, two training cycles ago, my tempo pace was my long run pace. I’m really improving!” Seeing yourself get better and better is great motivation to keep training and pushing yourself. The trouble comes when you have a bad run, or string of runs. Or when you’re coming back from an injury or any other type of setback. When you were “better” than you are, it’s hard not to compare. It’s hard not to worry about when you’ll get back to where you were. But, when you focus too much on how you’re not measuring up to where you think you should be, you start to hold yourself back mentally. 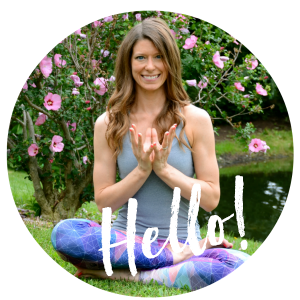 When I make those types of comparisons on my mat, I can feel the shift in my body. If I’m in a balancing pose, thinking about how I was able to get deeper into the pose yesterday, I’ll start to wobble or fall out of the pose. In other poses, I’ll start to feel my muscles tense and lock up. My breathing becomes more shallow. I’m not able to become more open, physically or mentally. My yoga practice is the one tool that has truly taught me how to practice living in the present. And, all of that practice has made it easier to live in the present off my mat, too. My mat provides the safe space and the constant reminder to accept myself for who I am in each moment. I simply explore where I am that day, knowing that no day is better or worse than the last, just different. There’s a reason why they call it a yoga practice. You’ll never be perfect at yoga, or any other thing. But with practice, you do get better at it. When you practice releasing negative, unhelpful thoughts, it gets easier. When you practice focusing on what you can control and letting go of what you can’t, it gets easier. When you practice living in the present moment and letting go of comparisons to the past or future, it gets easier. Your yoga mat is simply a place where this type of practice and self-exploration is encouraged. So, if you’re looking to become a mentally stronger runner, don’t be discouraged if you struggle at first. It’s all about practice. And, just like with running, it does get easier the more you do it. So true!!! I love the concept of breathing in to the pain, I use that a lot when things ache on a long run! I can ALWAYS use tips to work on my mental toughness, especially when running races. Thanks for sharing! And accept your body as it comes to you in that moment. 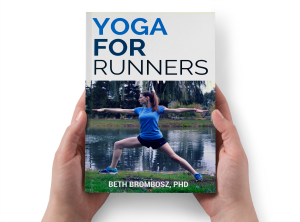 Not every run is going to be perfect or exactly the same as the last time that you did that run–just like with yoga!